About 2 years ago, I took up quilting. 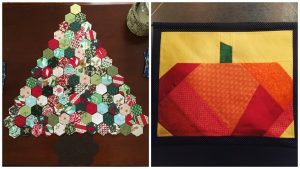 You can read all about how I became a quilter and the story behind it in my Journey to a Hobby blog. Since this post, I have delved even further into the world of quilting – I regularly attend quilt shows, have taken a number of quilting classes, returned to my beloved quilter’s getaway weekend in the Catskills, and I am working to build up a ‘stockpile’ to one day sell. My colleagues have also come to expect that on most work trips I will seek out the local quilt/fabric shop and come back with something! After about a year and a half of quilting I realized that my (3rd) sewing machine simply wasn’t making the grade. I knew if I wanted to continue to advance my skills I would need a better machine. That is when I realized that my grandmother’s mid-1990s Bernina 1260 sewing machine was sitting in their house, unused since she passed away in late 2013. Now, Bernina sewing machines are the top of the line in the world of sewing, and the best machines can easily run tens of thousands of dollars. Due to this, Bernina machines will last and function well for decades. The next time I visited my grandfather I asked if I could purchase the machine from him; he gladly agreed and was thrilled that it would be used again. Since acquiring the machine, my sewing skills have increased exponentially. One of the things I love to do is gift quilts for ‘life’ events and over the past year, I have had the opportunity to make quilts for weddings, graduations, baby showers, and Christmas. The featured image collage for this blog post are a wedding quilt I made for a good friend, and a black & white half-square triangle quilt, made for our house. 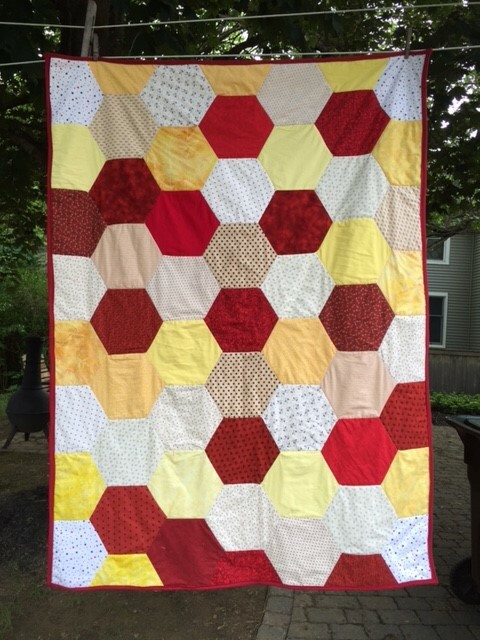 I made this quilt for my sister’s college graduation; her school’s colors were red and yellow. My grandmother had 13 grandchildren and before she passed away she made the majority of us a unique quilt, my youngest sister unfortunately did not receive one. This quilt is made out of fabric from my grandmother’s stockpile. This quilt was made for a good friend’s son; he had previously had twin girls and was thrilled to have a son that he could pass on his love of the Jets and Mets. To honor his die-hard fandom the backing fabric are the logos of his beloved teams. 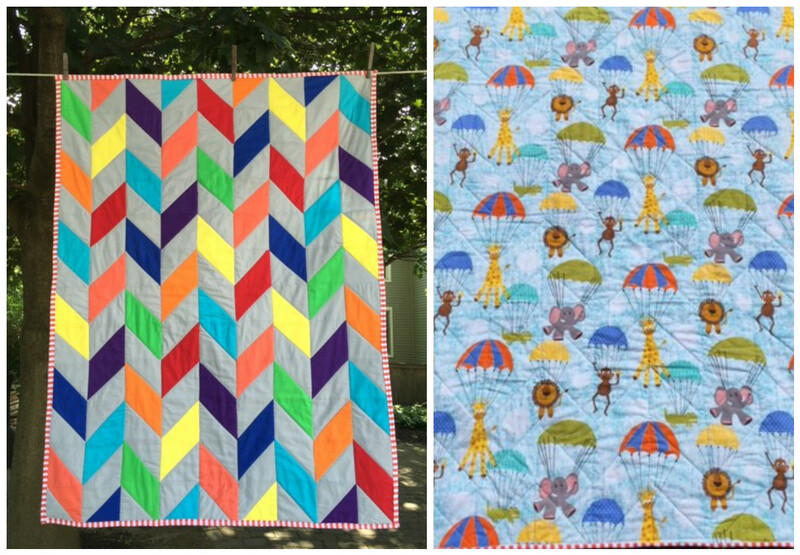 The quilt was made for my partner’s sister’s son, I gave it to her at her baby shower, and the colors are great and match the circus-themed backing! I made this quilt for my best friend’s wedding. She loves bright, bold colors and her wedding colors were mustard yellow and coral. This quilt was made for my partner’s aunt, whom I greatly admire! I knew she deserved a rock star quilt and toward the end of last year I felt comfortable enough to tackle a more challenging pattern. 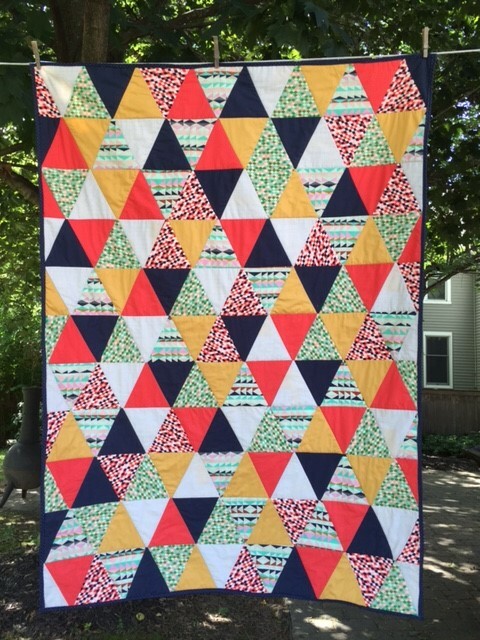 I made this quilt over a long weekend at Quilt Camp! I have also sewn some holiday décor using the English Paper Piecing and applique technique! These are seasonal wall hangings that I hang on the door it our entryway; I have many holidays to go! And lastly, tote bags! 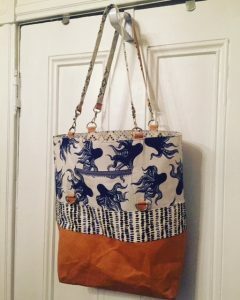 I love a good tote bag, I have many. This was the first project where I have ventured into the world of bag making and it turned out great! I also love the octopus fabric. Since then I have made two more! 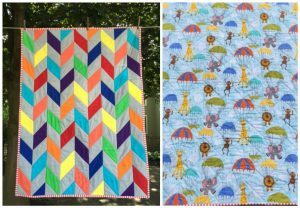 Awesome quilts and awesome article! i got a little choked up over your sisters graduation quilt. Thats beautiful.